Note: If you are connecting your wireless DS4 to a PS4 using a micro USB cable, click here for those instructions. This guide also has a couple of important steps to follow if you have a PS4 Pro console and a DS4v2 (CUH-ZCT2U) controller. 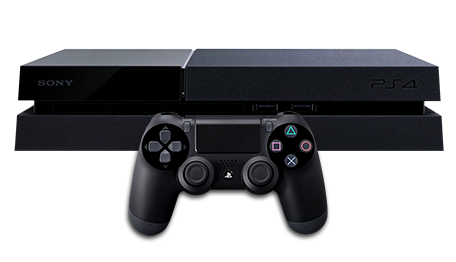 Set the Output Protocol to PS4 and Check the box to the Left of 'Enable DualShock 4/Wiimote Bluetooth searching'. 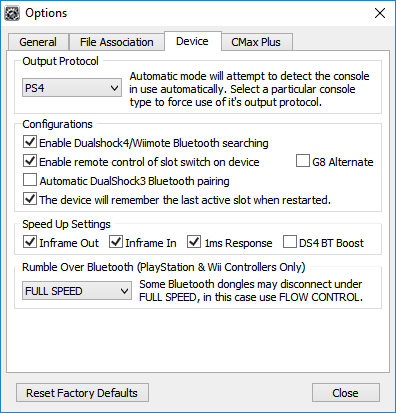 The recommended Speed Up Settings when using a DualShock 4 Controller with a Bluetooth 4.0 USB Adapter are as above - you can choose to tweak with them if you have any issues. DS4 BT Boost is disabled by default but can be enabled if you feel the DS4 controller performs better with your BlueTooth Adapter. If you have a slower Bluetooth adapter or experience any issues with rumble then you should try different 'Rumble Over Bluetooth' speed settings. You have the alternative options of Flow Control+, Flow Control and Disabled. 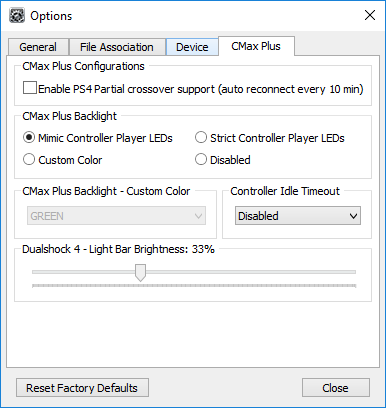 We also recommend you select the 'Mimic Controller Player LEDs' option if you have CronusMAX PLUS device. This is especially useful if you plan on using our GamePacks. The dot in the top left hand corner of the LED display will continue to flash while the CronusMAX PLUS is in use. This is perfectly normal as the CronusMAX PLUS is notifying you whenever it receives a security request from the console. If the LED on the CronusMAX PLUS does not change from AU to a number then the authorization controller is not authenticating. 99% of the time we find that this means the Micro-USB cable to the controller is faulty or not full data or simply not compatible, you should try another one. Another issue that sometimes comes up is that the controller USB port has a loose data pin. It will charge fine, but won't transmit data. Also make sure the controller is powered on of course - that's a rookie mistake, but be careful not to turn the console power on with the controller, as it will not authorize through the CronusMAX correctly causing the controller to disconnect after a few minutes. If you find that your DS4 controller disconnects at random times there are several things to check that should solve the problem. 2. The Bluetooth settings may need tweaking. Go to Step 1 in this guide and try disabling Rumble Over Bluetooth and also try enabling DS4 BT Boost to see if that makes a difference.